As a young person, did you ever try and make the world just a little bit better? Well, in Westlake, Ohio, there is a class of fourth grade students who are not just learning about problems facing our planet, they are taking action to solve them! “Holly Lane Elementary School is part of the International Baccalaureate Organization (known as the IB) which offers four high-quality and challenging educational programmes for a worldwide community of schools, aiming to create a better, more peaceful world. Holly Lane is part of the Elementary Primary Years Program (PYP). IB World Schools share educational standards and practices for philosophy, organization and curriculum that can create and sustain authentic global learning communities. In school, students learn about the world from the curriculum and from their interactions with other people. PYP Exhibition is the culminating event of a primary students’ education. Our internationally-minded students have progressed through a collaborative, critical thinking journey of inquiry throughout their primary years, here at Holly Lane. Students have explored local and global issues throughout their education and have learned conceptually with concerned, passionate PYP educators. As a school, we are also using exhibition as a reflection on teaching practices and to better support our students throughout their primary years. We are assessing our students and listening to them. We are listening to figure out where their hearts and their brains are, so we can help guide them in their learning and passions. When doing so, we keep in mind all aspects of the PYP: the knowledge, concepts, skills, attitudes, learner profile and action. We need to give enough breathing room, not so we have enough time to prepare for the final presentation, but also so students can explore. The big picture is that it is about the students. Listen to them. Care about what is going on around them. Question everything. Act on it. The exhibition should be a fun journey where everyone is breathing, learning and growing. I really believe this is a great way to end their last year at Holly Lane with such a meaningful project. This year our PYP Exhibition focused on the transdisciplinary Theme of: How We Express Ourselves–An inquiry into the ways in which we discover and express ideas, feelings, nature, culture, beliefs and values; the ways in which we reflect on, extend and enjoy our creativity; our appreciation of the aesthetic. Technology: Are Self driving cars safe? Nature: Unnecessary fear of animals (snakes, spiders, black cats, etc. As you can see we have some hefty issues, however they are manageable for our young students. As students created their central ideas and create their lines of inquiry, some topics needed to be tweaked appropriately. This is the great thing about this project. It is such an authentic way to learn. As part of the International Baccalaureate (IB) Primary Years’ Programme (PYP) Exhibition, students are expected to be active citizens and to take action to show understanding, to apply knowledge and skills, to reflect, and often to make a contribution to a cause or stimulate positive change. This year, Ali Muntaser and Mahdi Odetallah wanted to find ways to help the homeless, focusing on kids and homelessness. They reached out to the Community West Foundation located in Westlake. They asked how they could help families in their community. It was suggested that Peanut Butter and Jelly were staple items needed, so they held a collection at Holly Lane and donated the items after their presentation. 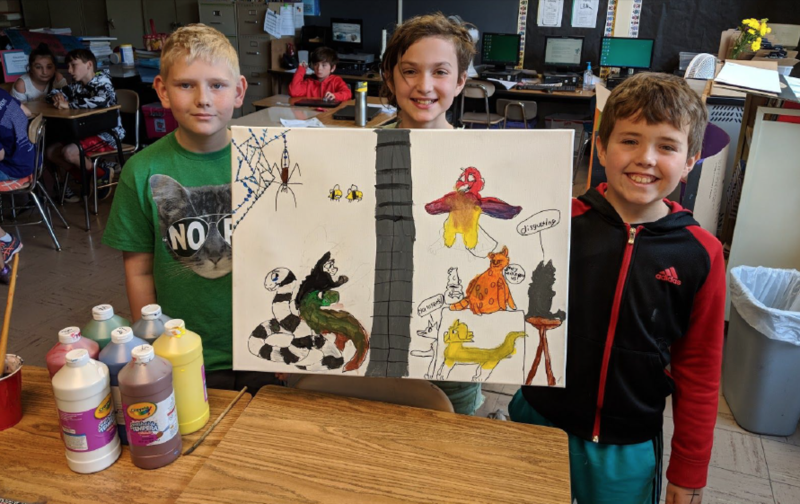 Another team of students, Leah Lohn, James Smith, and Oliver Brandstetter researched, Unnecessary Fear of Specific Animals in our Culture. They held a silent auction to raise money to donate to Save the Snakes nonprofit organization. Save the Snakes is dedicated exclusively to snake conservation and human-snake conflict mitigation. Their mission is to protect threatened snake populations around the world through habitat preservation, education and community outreach to create a harmonious relationship between humans and snakes. Another group with teammates, Aidyn Blackburn, Grace Bryar, and Andrew Bedell learned about Climate change and its effects on polar bears. They created a painting depicting the struggle polar bears are going through because of climate change. In the painting, polar bears are unable to hunt as the icebergs are melted by the hot sun. The money they raised will be donated to the World Wildlife Fund. At WWF, they believe we can fight consequential threat and build a safer, healthier and more resilient future for people and nature. They believe that we need to rethink about the way we produce and consume energy, food, and water; protect the world’s forests; and help people prepare for a changing world. We greatly appreciate the student’s efforts, not only to support Save The Snakes, but learning about and taking action on so many other important issues that impact our world. As a token of our gratitude, Save The Snakes Executive Director Michael Starkey gave an online presentation about snake ecology and conservation to the students. He explained to the students how the money they raised will directly support our international snake conservation programs. Thank you Holly Lane Elementary School! Special Thanks to Leah, James, and Oliver for learning about snakes and helping us save them!